18+. New players only. No deposit required. 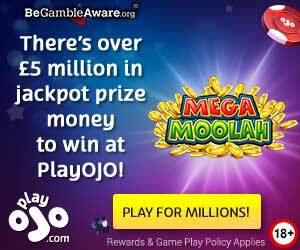 Up to 50 locked free spins available to win via the New Player Bonus, usable on Reel Royalty only. All winnings paid as bonus credit. This Bonus expires 14 days after player registration. Max withdrawal without depositing is £50. Bonus credit has x20 wagering requirement. Deposits have a x1 wagering requirement. You can withdraw the funds in your cashable credit account. T&Cs apply, BeGambleAware.org.